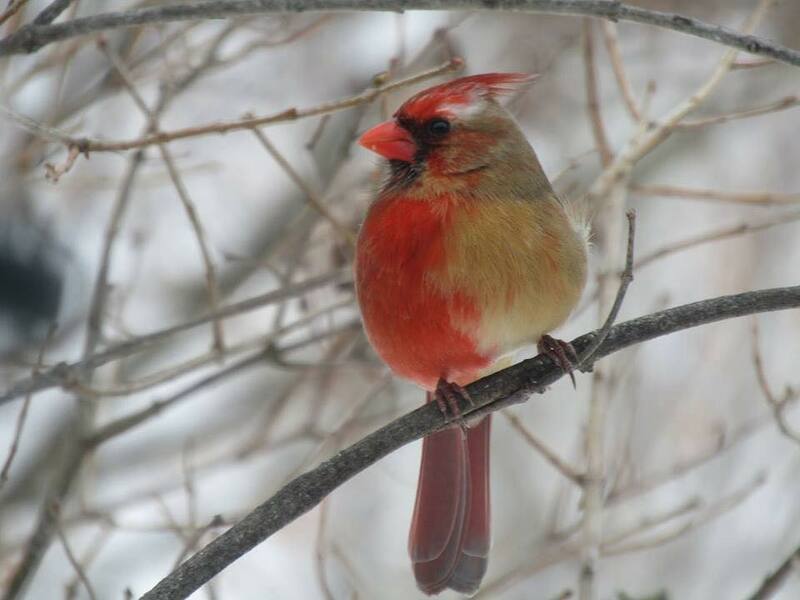 This past Sunday, my neighbor texted me a link to a National Geographic story about a remarkable bird: the half-male, half-female Northern Cardinal pictured above. Shirley and Jeffrey Caldwell spotted it recently in their backyard in Erie, Pennsylvania. My neighbor wanted to make sure I had heard about it, and I certainly had, since the story had been shared widely for a few days by then. Today, a week or so after news about the Erie bird became public, it is still being shared a lot on Facebook and Twitter — by non-birders as well as birders, conservation organizations, birding clubs, and other groups affiliated with our hobby/pastime/obsession. And I’m not surprised, of course. It’s a very cool bird. 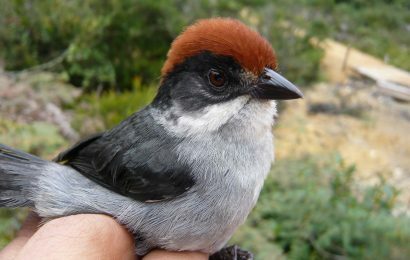 It’s quite rare to see a bilateral gynandromorph of any species — an animal in which one half of the body is male and the other is female. 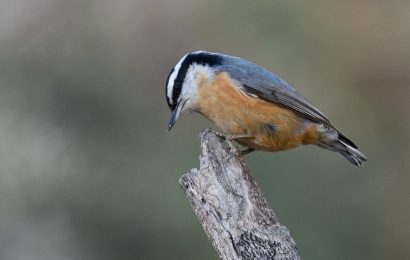 The anomaly may occur more widely in nature, but it would be difficult to tell with a Blue Jay, Great Blue Heron, or other species in which the sexes look the same. But with a cardinal — wow, it would grab anyone’s attention. “Cardinals are one of the most well-known sexually dimorphic birds in North America — their bright red plumage in males is iconic — so people easily notice when they look different,” Daniel Hooper of the Cornell Lab of Ornithology tells Nat Geo. Despite the widespread interest in this bird and atypical animals in general, it seems to me that our interest only goes so far. We’ll look at the photos, read the stories, share, comment (perhaps), and then move on. Birders don’t actually go out and try to see birds such as this cardinal with our own eyes. Even when we could drive to the spot where it has been seen reliably for more than a week. 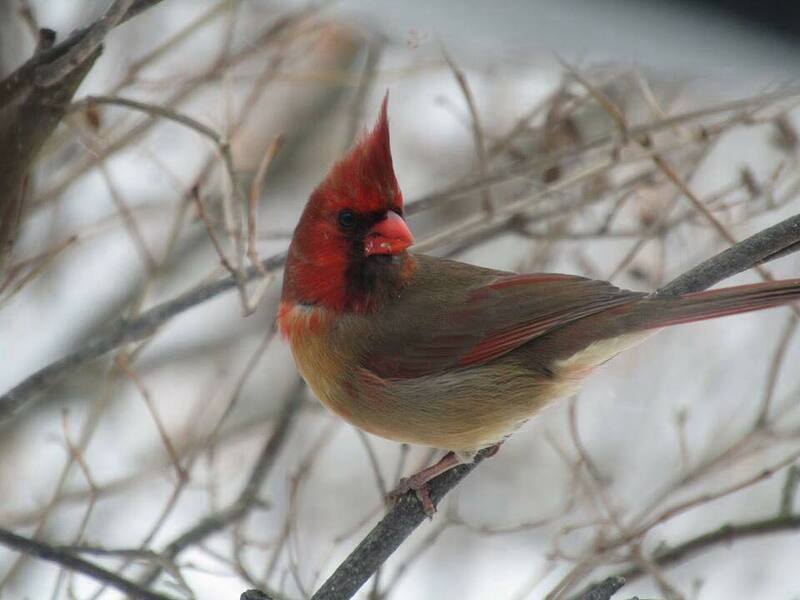 Shirley Caldwell told my colleague T.J. Buzzeo that since she and her husband first got a good look at the bird 10 days ago, it has continued to visit their backyard regularly along with a normal male cardinal. What she hasn’t noticed, however, is other birdwatchers. The yard is visible from her street, she says, but even though she has been watching for other observers, she hasn’t noticed any. I checked the Pennsylvania and Ohio birding listervs and did not find a single notice from members about this bird. No one posted directions to the yard, or additional photos, or tips for when to go. 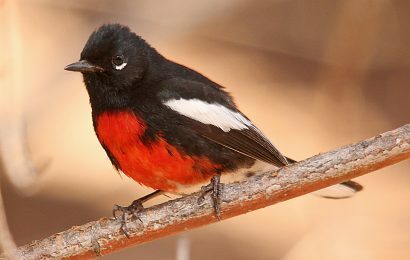 If the Caldwells were hosting a Calliope Hummingbird, Black-headed Grosbeak, or some other vagrant from thousands of miles away, you can bet they would be enjoying the company of many, many strangers toting thousands of dollars worth of optics. They would all, with good reason, be trying to add the wayward bird to their life lists — and a large percentage would be shooting photo after photo of the visitor. But no birder would travel to Erie or anywhere else to add Cardinalis cardinalis to their life list. Nor do I know anyone who keeps a list of gynandromorphs they’ve seen. This isn’t a criticism of listing. On the contrary, I’m all for it. As long as birders walk this earth, they will be listing. It is an observation, however, and perhaps a lament, that we’re not inclined to want to see in person a rare, extraordinary version of a common and familiar species. Makes me wonder what else we’re overlooking.